...is apparently all I do now? Well that and watch the X-Files, those two things. I've been having some issues with my sleep schedule lately so I basically spent a LOT of hours from 10pm to 3am working on this this week. I really like how it came out! I learned French knots!!! I REALLY like some things about it and only kinda like others, but it's good that now I can look at this and know what works and what doesn't. Like for example I probably won't do another red flower like that one. But I love the delphiniums! 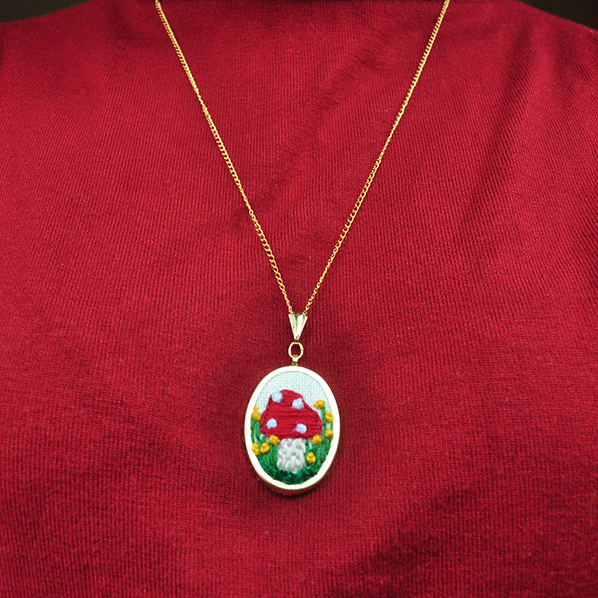 And then I made a tiny toadstool necklace pendant :3c eeep I love it. It is for sale, but until someone buys it I am very tempted to wear it around. I think it's soo cute! ps like my turtleneck? TURTLENECKS ARE COOL.